Home » Hiking Tips » How Accurate are Wrist-Based Heart Rate Monitors? How accurate are wrist heart rate monitors? Many new sports watches feature wrist-based heart rate tracking and ever since I bought the Suunto 9 Baro watch with wrist HR, I’ve been wondering how accurate the readings actually are. I’ve read a lot about the accuracy of wrist heart rate monitors online, but I haven’t found a single article that would be based on facts rather than on feelings and beliefs. Therefore, I decided to conduct my own experiment. For the experiment, I wore the Suunto 9 Baro watch with wrist-HR on one wrist and the Suunto Ambit 2 watch on the other, paired with the Suunto Dual heart rate belt. 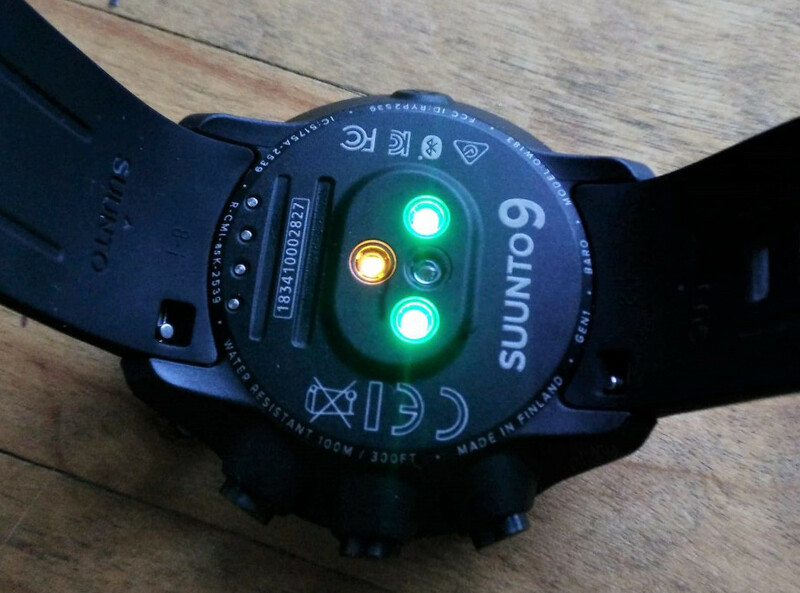 The Suunto 9 watch is not compatible with Suunto Dual heart rate belt and therefore it was measuring heart rate from the wrist while Suunto Ambit 2 measured heart rate from the belt. I wore both watches during four different activities: Outdoor running, treadmill running, weight training, and cycling. I know that Suunto Ambit 2 with Dual heart rate belt provides very accurate heart rate readings as I’ve been using it for years. In the experiment I wanted to compare heart rate readings of Suunto 9 (wrist HR) and Suunto Ambit 2 (heart rate belt). Long story short, wrist HR technology is much more accurate than I expected, and in the following I’ll explain my findings. However, note that I only measured wrist HR with the Suunto 9 watch and I don’t know how accurate other devices with wrist heart rate technology are. The Suunto 9 watch is equipped with wrist HR technology from Valencell. The same technology is also used by Suunto Spartan watches, Atlas Wristband, TRIO fitness sensor and some Scosche heart rate monitors. Garmin, Apple and FitBit all use different technologies – Garmin uses its own optical-based Elevate sensor while FitBit uses PurePulse optical sensor. How did I compare heart rate readings? Note that only entries made at the same time were counted. For example, Suunto Ambit 2 also made an entry at 05:22:06 and Suunto 9 made an entry at 05:22:08. However, we can’t compare these two entries since they weren’t made at the exact same time. Nevertheless, the charts below are based on at least 100 entries each. The stated average heart rates below are from Suunto Movescount app which takes all entries into account. 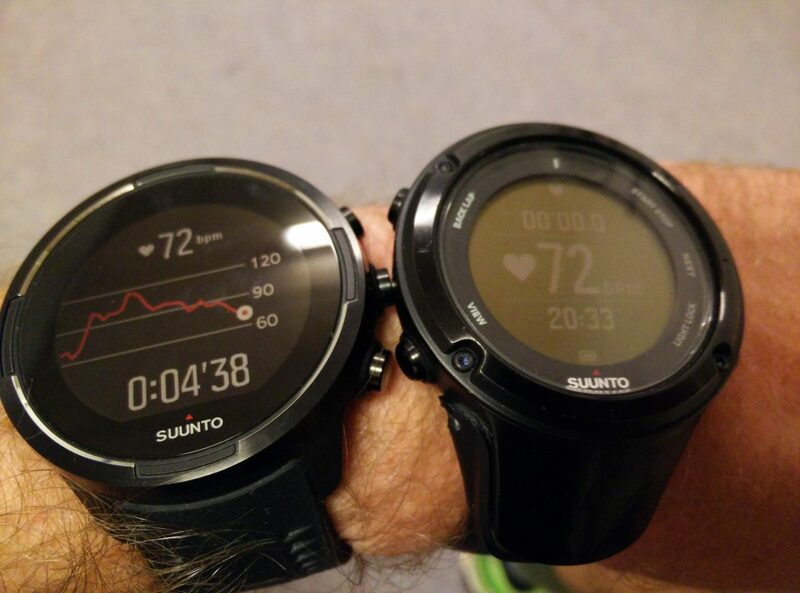 I compared heart rate readings between Suunto 9 (wrist HR) and Suunto Ambit (heart rate belt) on a 6-kilometer run. The temperature was quite low (5° C, 41° F) and therefore I didn’t expect particularly accurate readings from the Suunto 9, as Suunto states in this article that low temperature can make it difficult for the optical sensor in the watch to measure heart rate accurately because the blood flow gets directed from arms to the core of the body at low temperatures. However, I was pleasantly surprised how accurate the wrist-HR readings of the Suunto 9 were. Note that I didn’t wear gloves. I was wearing the watch tight against my skin on my left wrist. Below is the comparison chart between the HR belt (paired with Suunto Ambit) and the wrist HR on the Suunto 9. Let’s first have a look at the anomalies. In the beginning the Suunto Ambit 2 watch measured a much higher heart rate than the Suunto 9 watch. So, what happened here? First of all, I would know it if I had a heart rate of 170, and on this easy run I definitely didn’t have so high heart rate. I’m quite sure that the heart rate belt was inaccurate in the beginning due to static electricity. As DC Rainmaker explains in this post, synthetic t-shirts can produce static electricity which messes with the readings of a heart rate belt. As we see in the chart above, this stopped after 10 minutes or so, when my skin got wet of sweat. From there onwards the readings were surprisingly similar. Overall, I think that Suunto 9 wrist-HR readings were more accurate on this run, because Ambit’s heart rate belt got affected by static electricity in the beginning. After the outdoor running test, I decided to compare heart rate readings for treadmill training. The temperature in the gym was around 19° C (66° F) and therefore I expected that the wrist-HR readings will be even more accurate. If we look at the chart below, they indeed were. Before measuring, I warmed up (got sweaty) with easy-paced running to avoid static electricity issues with heart rate belt which I encountered during first test. Then I started measuring heart rate with both watches. The differences between wrist heart rate monitor and heart rate belt were minimal. Even during intervals (see the three spikes on the chart) both watches produced accurate readings. According to many reputable sources, wrist heart rate sensors are not perfect for weight training because flexing muscles, gripping weights etc. messes the readings. Optical heart rate sensors (as the one in Suunto 9) are based on blood flow and when you squeeze your hand, you of course change the blood flow through your wrist. I measured my heart rate with both devices while doing back exercises like pull-ups, bent-over row etc. If we look at the chart below, it seems that I can confirm the reputable sources. During weight training the wrist heart rate monitor didn’t produce accurate readings most of the time. On the chart you can see that the heart rate measured with the wrist-HR occasionally dropped while heart rate measured with the belt increased. That’s because I was squeezing weights and thus affecting the blood flow through my left wrist. For weight training I would therefore not rely on a wrist heart rate monitor. I also tested the accuracy of wrist heart rate sensor while cycling. I didn’t expect very accurate readings because you are gripping the handlebar while cycling and your hands can get very cold. And according to experts, it is exactly cold hands and gripping objects which are the main reasons for inaccurate readings. In the chart above we can see that the wrist heart rate monitor produced very inaccurate readings during the first six minutes. However, it eventually started measuring surprisingly accurately. I think that the readings from the first six minutes are messed up because my hands were very cold – it was only 5 C° (41° F) outside. When my hands warmed up, the accuracy of readings increased and eventually there was almost no difference between wrist hr and belt hr. During this experiment I figured out that wrist heart rate sensors can actually be very accurate. However, they do have limitations. The readings are inaccurate if your hands are very cold or if you are gripping objects such as weights. Therefore, I don’t recommend using wrist heart rate monitors for weight training, crossfit, cycling in very cold weather etc. However, I see no reason to avoid wrist heart rate monitors for running, non-technical hiking and other sports that don’t involve clenching your hands. The experiment revealed that the difference in average heart between heart rate belt and wrist heart rate sensor is almost non-existent while running. Inside, on a treadmill the difference was only 1 BPM whereas the difference was merely 2 BPM while running outside. I wouldn’t be surprised to hear that top-tier wrist heart rate monitors are more accurate than budget heart rate belts for activities that don’t involve clenching your hands. I’d love to hear about your experiences with wrist heart rate sensors. Write them in the comments section below. Thanks for this article, I found it as I’ve been trying to work out where I’m going wrong with my Suunto 9. Even on easy runs my optical HR can read 180-190+ which is really inaccurate, I’d expect around 140ish. I’ve followed their guide with locating to HR early, warming up etc but I’m wondering if there’s something else at play like the way I’m wearing it (as per their guide – 2 fingers up the wrist). I’m impressed with the readings in this article, mine are never anywhere near that! I was also very surprised over the accuracy – before doing this experiment I had a feeling that the readings are inaccurate (too low) but it turned out that they were pretty accurate. But if your watch is measuring +180 and you are not out of breath than something is obviously not working properly. It really surprises me that you are getting so high heart rate via wrist because most errors that I encountered showed lower heart rate – as seen in the cycling chart. It is indeed possible that this has to do something with the way you are wearing the watch. I know Suunto recommends wearing it 2 fingers up the wrist but for me that just didn’t work. The watch sooner or later slipped down my wrist and became loose. Hence I started wearing it just above the wrist bone so that the top button literally touches my wrist bone. I also wear it very tight against the skin. The strap is somewhat stretchy and I typically stretch it before locking it. I hope this will help you fix the issue. Congratulations for a wonderful blog! My wife uses wrist heart rate monitor and the other day we were comparing its data with a regular heart rate monitor. The results matched. However, it really depends on the wrist heart rate monitor. I’ve seen some really crappy products that don’t provide any relevant results. My general opinion is that one should invest a little more money for a high quality product, otherwise there is no point in giving money at all. I completely agree with you – invest a bit more and get a good product. However, it is true that the reliability also depends on other factors such as wrist size, watch fit etc. I believe that not everybody gets accurate results and that’s also the reason why manufacturers state that the results should be used as estimates. Nevertheless, I’m very surprised over the performance of Valencell wrist-hr technology.